Vacaville, CA -Extreme Outback Products goes off the deep end with its new ExtremeAire Triton. Believed to be the world’s first submersible continuous-duty electric compressor, the fully sealed Triton has a 100-percent duty cycle. 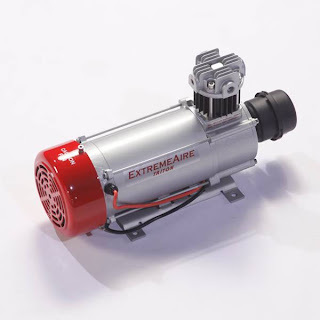 Crucial components include a 1.5-horsepower fan-cooled motor and other parts shared with Extreme Outback’s “normal” ExtremeAire Magnum compressor: permanently lubed and sealed bearings, heat-dissipating cylinder coating and stainless steel hardware. The ExtremeAire Triton can be mounted in any position. It’s ideal for off-road, RV, agricultural, military, construction and motorsports support: Uses include tire and air-suspension inflation, powering pneumatic tools, and actuating Air Lockers and train horns. Working pressure is 150 psi (80-amp draw). Dimensions are 16 x 6 x 9 inches, weight is 21 pounds. 12- and 24-volt models are available, and Extreme Outback offers an extensive line of installation kits and pneumatic accessories. The ExtremeAire Triton won a Global Media Best New Product award at the 2009 SEMA trade show. – Available in 12 and 24 volts.